Tesla shares remained volatile on Monday amid doubts about Elon Musk's ability to take the company private. Shares in the electric car maker started trade down more than 4%, but recovered to close in positive territory. 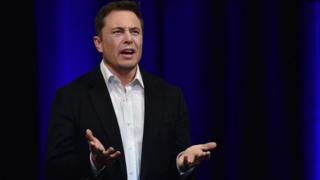 The shares have dropped by about a fifth since Mr Musk revealed his proposal in a tweet on 7 August. Some analysts predict Tesla has further to fall: JPMorgan Chase has cut its price target from $308 to $195. The bank's analysts cited doubts about Mr Musk's claims to have secured funding for his plan to take the firm private. "Tesla does appear to be exploring a going private transaction, but we now believe that such a process appears much less developed than we had earlier presumed (more along the lines of high level intention)," said Ryan Brinkman at JP Morgan. The bank had raised its forecast following Mr Musk's tweet, which he later said was based on discussions with Saudi Arabia's sovereign wealth fund. However, Mr Brinkman said it was now clear that the fund's commitment remained uncertain: "Formal incorporation into our valuation analysis seems premature at this time." Tesla shares hit almost $380 on 7 August following Mr Musk's tweet, but have continued to fall since then. They opened below $293 on Monday - off by more than 4% - but regained ground over the course of trading to close at about $308, up almost 1%. The slide this month has been good news for short sellers, who bet that Tesla's share price will fall. In recent years, their holdings have declined in value as the share price rose sharply. Since the now infamous tweet, the value of their holdings has risen by more than $1.2bn, according to S3 Partners, a New York research firm. Mr Musk has a well-known dislike of short sellers, whom he has called "jerks who want us to die" and argued that taking Tesla off the stock exchange would shield it from their attacks.